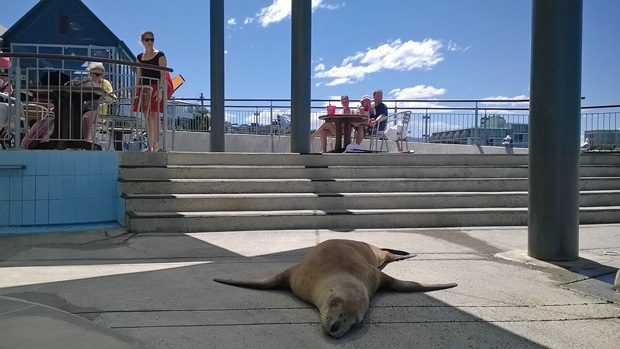 Today’s photo of the week is of a curious New Zealand sea lion that waddled through two sets of automatic doors to swim laps at a Dunedin public pool on Saturday. DOC’s David Agnew managed to get this photograph while attempting to shepherd the sea lion back to the Dunedin surf. The swimming public was moved out of sight and the sea lion eventually left the complex back through the automatic doors. New Zealand sea lions are only found in New Zealand and are one of the rarest species of sea lion in the world. They are found mainly on beaches in Otago and Southland and in New Zealand’s subantarctic islands. Saw this on Facebook and in the paper – great story. Awesome experience for all those concerned. Curious little fella.